C4 Sport pre-workout combines performance and energy into one, so every base of your workout is covered. When taken 30 minutes prior to exercise and physical activity, C4 Sport pre-workout supports energy and focus. C4 Sport proudly wears the Informed-Sport logo. The Informed-Sport logo signifies that every batch of this product has been tested for banned substances. From the makers of America's #1 pre-workout brand, Cellucor C4 Sport provides a performance and energy boost that helps you in your journey towards becoming the best. C4 Sport includes electrolytes in every serving. C4 Sport is pre-workout energy optimized for exercise. It combines two formulations to support performance and energy into one, so every base of your workout is covered. The performance side includes creatine monohydrate for muscle endurance, Arginine AKG to keep you going, and beta-alanine to help keep fatigue at bay. The energy side contains an explosive blend of caffeine and taurine for unrivaled focus and energy. 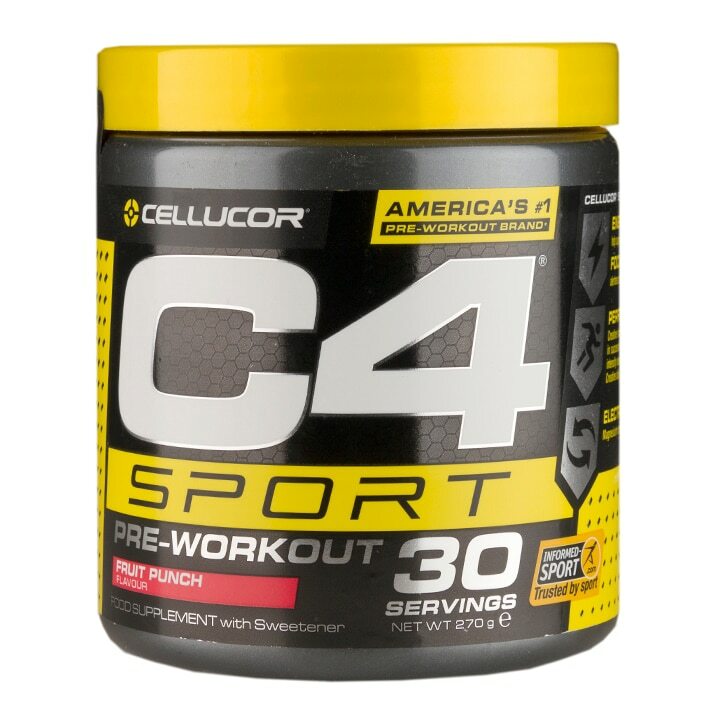 Take one daily serving (1 level scoop) of C4 Sport mixed with 200-250 mL of water. Do not exceed recommended daily dose. Food supplements should not be used as a substitute for a varied, balanced diet and healthy lifestyle. Store in a cool, dry place. KEEP OUT OF REACH OF CHILDREN. Micronized Creatine Monohydrate, Carnosyn Beta-Alanine, Taurine, Acidity Regulators (Malic Acid and Citric Acid), Bulking agent (Polydextrose), L-Citrulline, Magnesium Salts of Citric acid, Flavours, Sodium Citrate, Anti-Caking Agents (Silicium Dioxide and Calcium Silicate), Caffeine Anhydrous, Sweetener (Sucralose), Acidity Regulator (Dipotassium Phosphate), Colour (Allura Red), Vitamins (Pyridoxal-5-Phosphate and Methylcobalamin). THIS PRODUCT IS ONLY INTENDED TO BE CONSUMED BY HEALTHY ADULTS, 18 YEARS OF AGE OR OLDER. Do not use this product before consulting a licensed, qualified, health care professional, especially if you are taking any prescription drug or over-the-counter medication; or, if you suspect you have or have been treated for, diagnosed with, or have a family history of, any medical condition. Do not consume caffeine from other sources while taking this product. Discontinue use 2 weeks prior to surgery. Do not use if safety seal is broken or missing. This product is sold by weight, not volume. Some settling of powder may occur during shipping and handling, which may affect density of powder. This product contains the servings indicated when measured exactly by weight. Because of the presence of creatine, this product is intended only for adults. Do not use during pregnancy. Contains caffeine (135 mg per daily serving), not recommended for children or pregnant or lactating women. Cellucor C4 Sport Pre-Workout Fruit Punch is rated 5.0 out of 5 by 1.